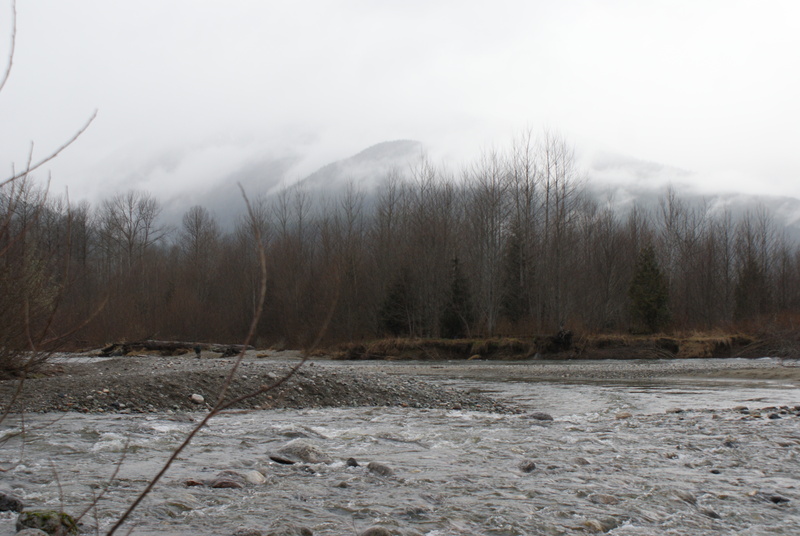 Our first trip of the New Year found us driving up the Skagit with friends to see the eagles. Every winter, bald eagles flock down from The North, following the abundant salmon runs. Local communities celebrate the return of the eagles and the salmon, and bird watchers venture down to the winding roads to see how many eagles they can see in the trees and on the river banks. We’ve gone many times, but it’s becoming a traditional event, and we felt like the time was right to go again. Some friends of ours wanted to join us today, and we caravaned up the road together. We made our first stop at the pullout at Milepost 100, where we saw a juvenile eagle fly over, but that was about it. When we were leaving, we saw one in a tree by the stop sign. There were two more up the road, and then we saw several more up by the fish hatchery in Marblemount. 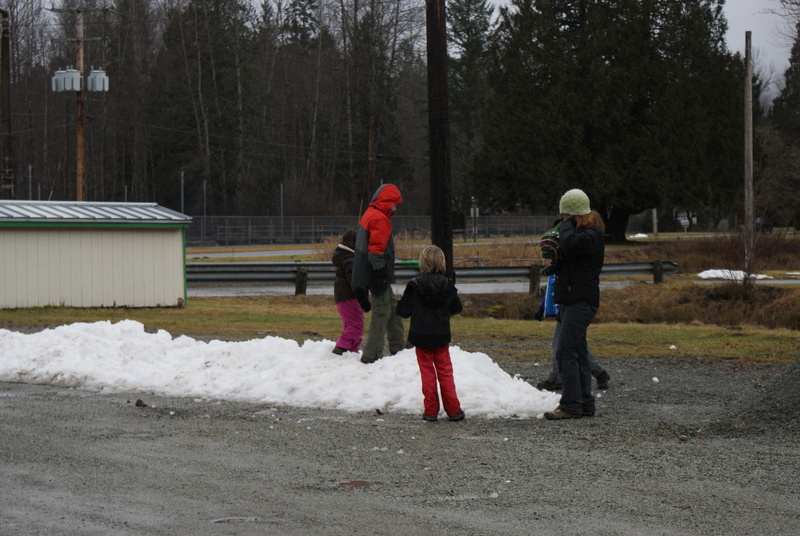 We pulled into the fish hatchery parking lot, and the kids were excited to see some small piles of snow leftover from a previous plowing. As they played in the snow, we prepared for a little walk down the fishery paths to the river. 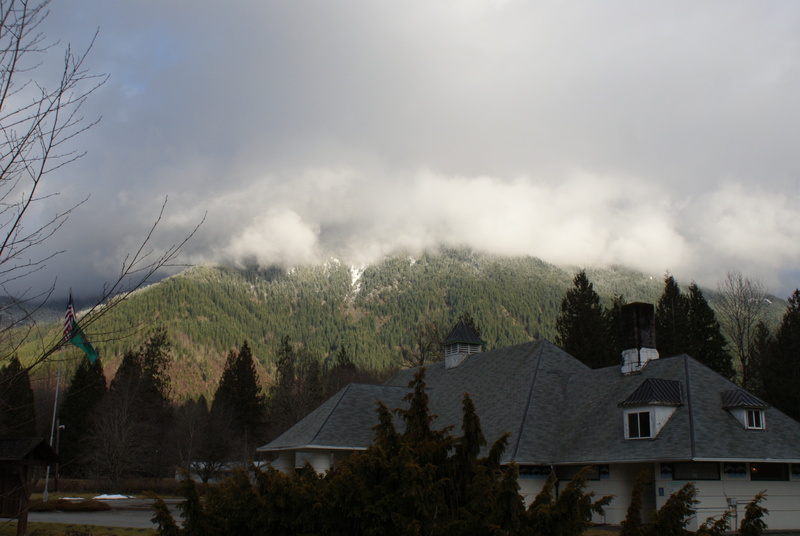 It was a brisk morning, and the clouds were spitting occasional showers. 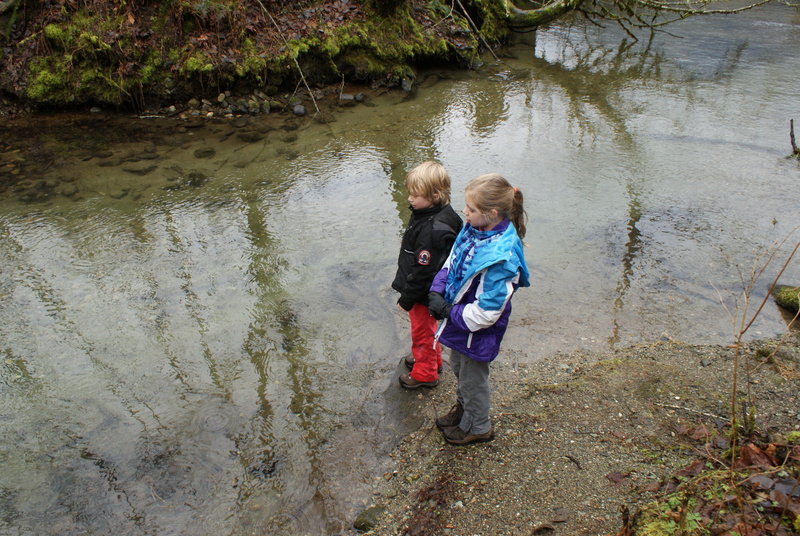 So we put on our winter coats, hats and mittens, rounded up the kids and walked down around the fish holding tanks to the stream. 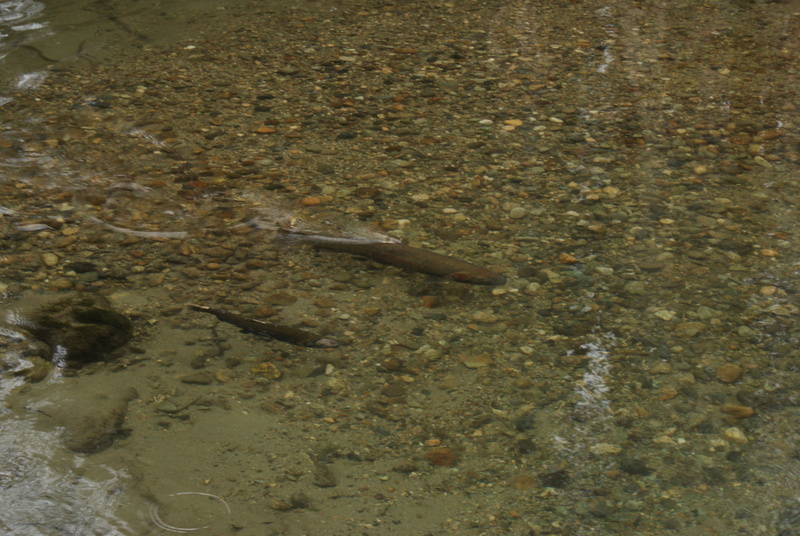 We immediately saw salmon in the little stream, as well as some hatchery fish. I always feel kinda sorry for the poor fish, they look so ragged and exhausted. Dead fish sunk to the bottom of the stream bed, and we found one stinky carcass that had been dragged up onto the bank and partially consumed (Dead salmon are an important medium for nutrients to be replenished in our woodland ecosystems.) The Circle of Life song ran through my head all day. 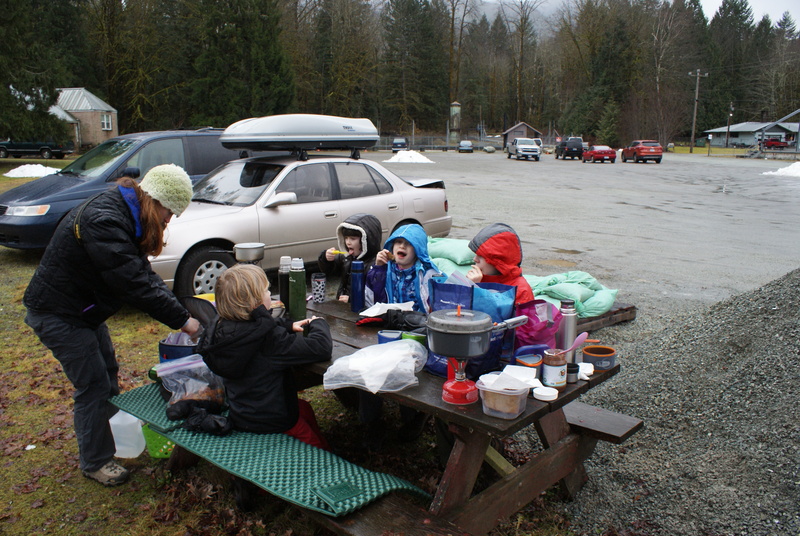 The kids were getting hungry at this point, so we walked back to the cars and set up our stoves on the lone picnic table to make a hot lunch. Soup was on the menu (I ate a serving of last summer’s dehydrated marinara and pasta) and we all had hot cocoa from our thermoses. Of course, it started raining in earnest at that point, and the kids were getting a little chilled and grumpy, so as soon as we were done eating, we packed up. The kids played some more in the snow, getting soaked and enjoying their little taste of winter. There were some patches of blue sky, and Annika was complaining that we weren’t doing a real hike, so we decided to go down to Rockport State Park and do some of the trails there. We are fond of this special park, with its giant trees draped in moss and ferns. We walked west on the Evergreen Trail and connected with the West Loop Interpretive Trail. This easy, graveled path is softening around the edges now, looking more like a wilderness trail than the wheelchair-accessible trail it was originally designed to be. 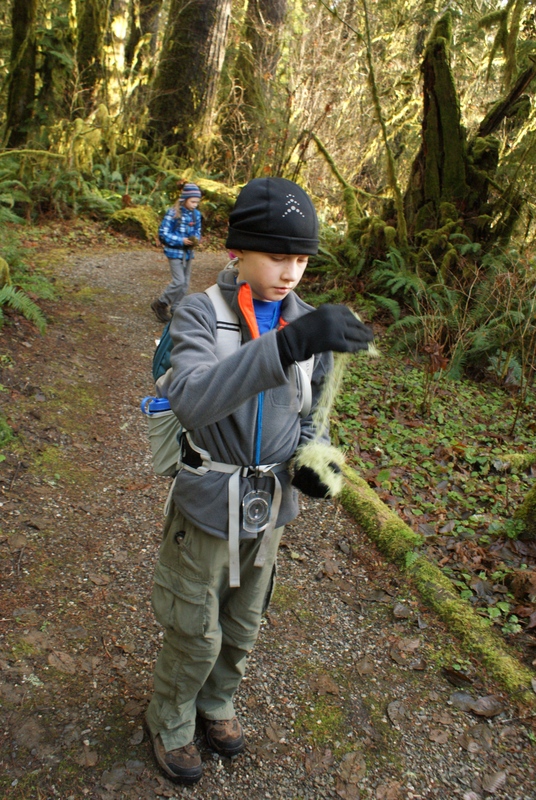 We marveled at the fungi, lichens, mosses, ferns, and huge trees. Many of the fallen giants left huge holes where their root wads came out, and these were impressive. It was good for the kids to run, to imagine, to see and smell, and to marvel over the ancient timber. 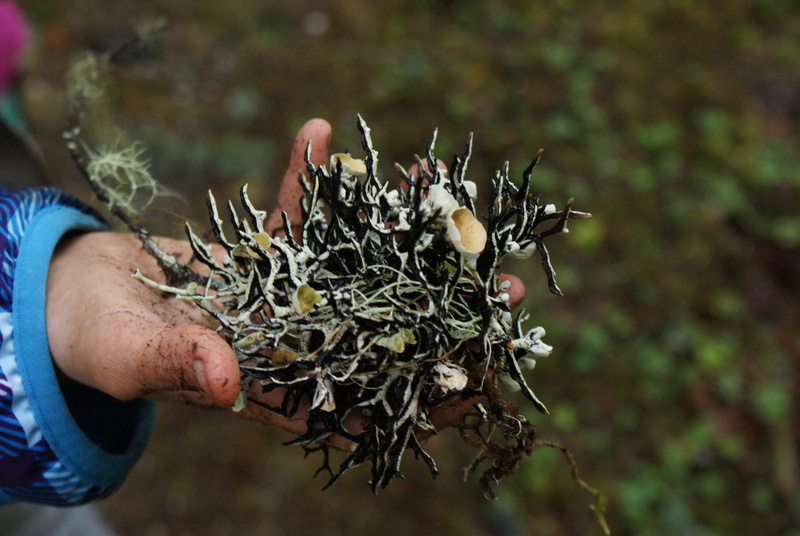 We think we found some homes for fairies, and apparently helped make some bird nests out of moss for the spring. At the end of our walk, we stopped in at the park office, where a ranger was on duty and some educational materials were displayed. I’ve been to the park several times, but never knew there were any interpretive items for the public there. The ranger on duty let us feel the different pelts and birds. Though it’s uncomfortable sometimes to see dead animals on display, they do help us have a greater appreciation for the critters around us. We finished all of our wanderings and were on the road before dark. I asked Annika what her favorite part of the day was, and she said “Galloping around!” I guess she felt the need for some exercise today. I was really glad we got to get out today, and it was doubly fun to have some friends along. 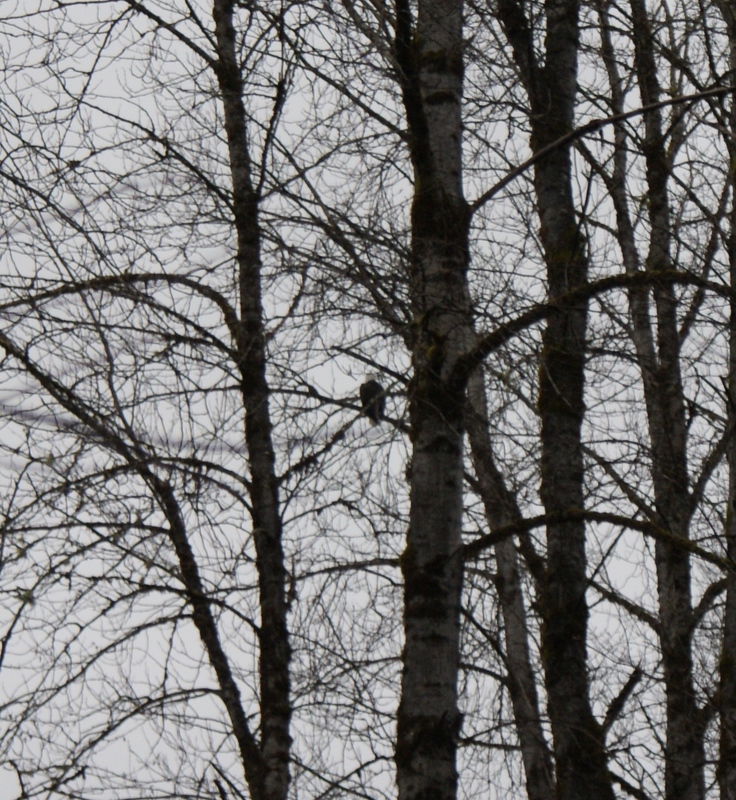 Birds sighted: 12 bald eagles for the day, numerous red-tailed hawks along the freeway on the drive up, common goldeneye (one male, two females) in the fish hatchery, kingfishers, ravens and crows at the hatchery, and an American dipper in the hatchery stream near the river. Other animals: We saw 5-6 deer crossing the road west of Marblemount, and the little Douglas squirrels in Rockport SP. 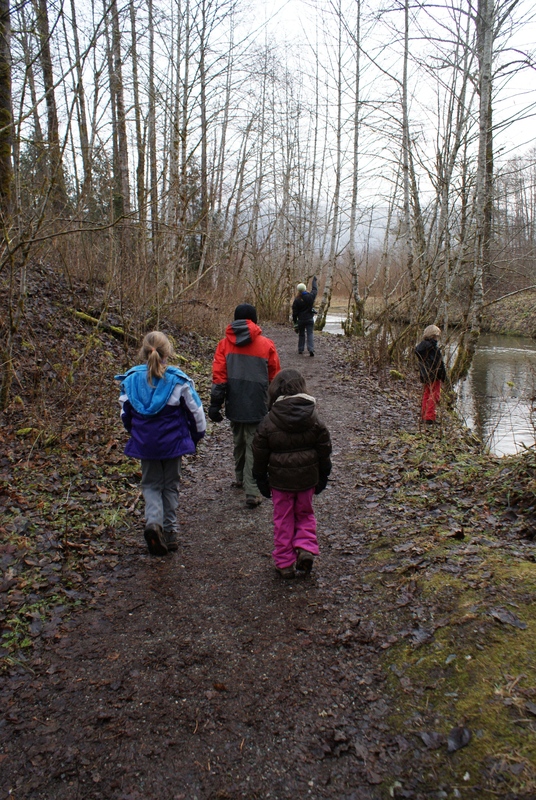 Find info about the Skagit River Bald Eagle Interpretive Center: http://www.skagiteagle.org/index.php They are open on Saturdays and Sundays through January, with a warm fire and lots of information about eagles, salmon, and the area. The fish hatchery in Marblemount is open for tours on weekends during the eagle festival. They have self-guided tours for when they aren’t open. 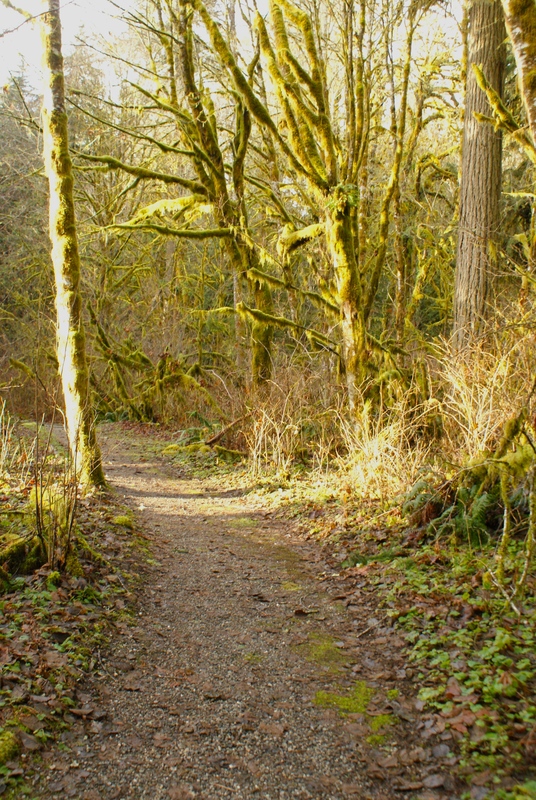 You can walk the trails any day, and no permits are needed for parking. Rockport State Park is open all week except Wednesdays and Thursdays. 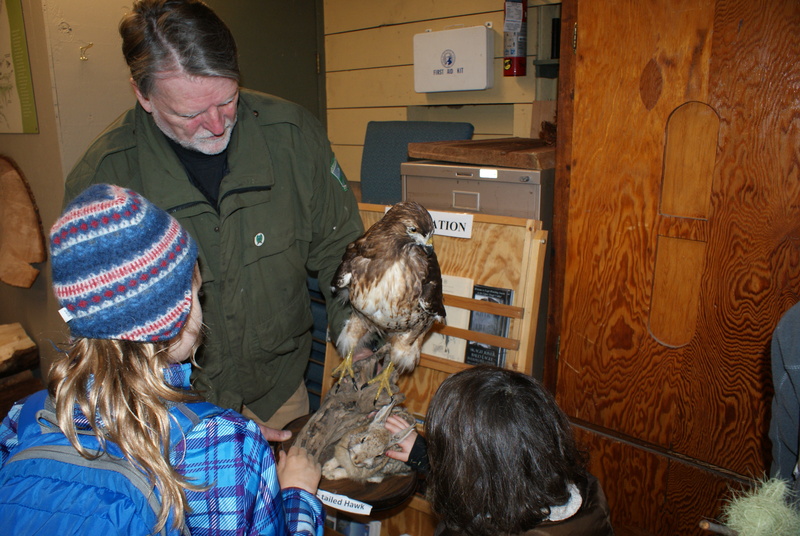 The ranger office is open Friday through Sunday, and on weekends through February they will have crafts and educational materials available for kids and a warm wood stove to drive away the winter chill. Events are free, but you’ll need your Discover Pass to access the park. There are about 6 miles of lovely trails there, well worth your time to hike and stretch your legs after driving up the river.